In art school, there were serious debates about whether or not gray is a colour. The debate is still ongoing, since gray is achieved by mixing complementary colours (red with green, orange with blue) but is, by visual definition, a colourless tone, a mid-point between black and white. Gray, a neutral, can be easily pigmented, however, by light or adjacent tones, giving it striking resemblances to actual colours: a gray sky at noon looks almost pale blue compared to that same gray sky at dusk, which looks more earthy and dark. Similarly, gray paint destined for a living room wall can be tinted to be either warmer or cooler by adding shades of brown or blue to the gray base. What can be easily defined is gray's relationship to true colours. Gray acts as a serene and effective backdrop to the vibrancy of primary colours, like red or green, giving them a platform to jump from. Ever gone walking on a drizzling spring day and noticed how the grass and leaves on the trees seem more vibrantly green than when they're blanched by intense summer sunlight? The same is true for interior spaces where gray is becoming an ever-more popular choice in decorating: a gray room will give any colourful accessory within its purview a moment to shine. My own love of gray is rooted in the serenity described above. It's restful to the eye and calming to the soul, provided it is done with warmth: horrid gray cubicles under fluorescent lighting or the gray concrete walls of a prison are not terribly endearing. I am a sucker for neutrals, but especially those closer to the white and gray end of the spectrum. There's something peaceful and reflective about gray rooms. 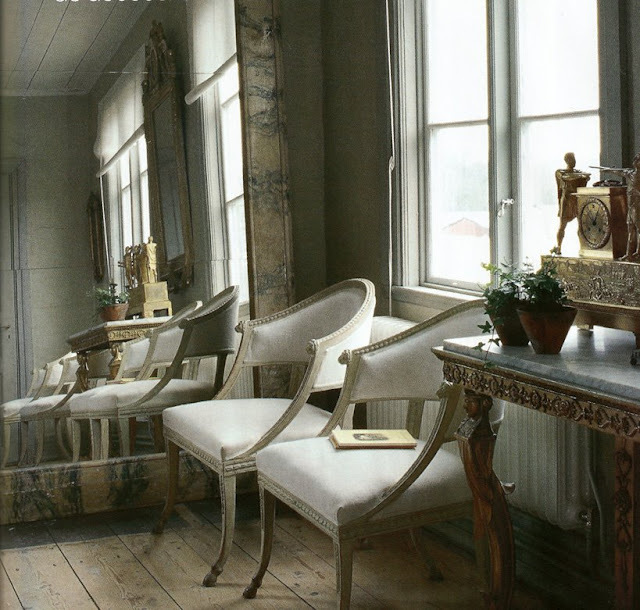 I've selected some imagery of interior spaces, below, that illustrate the great possibilities of the gray indoors. 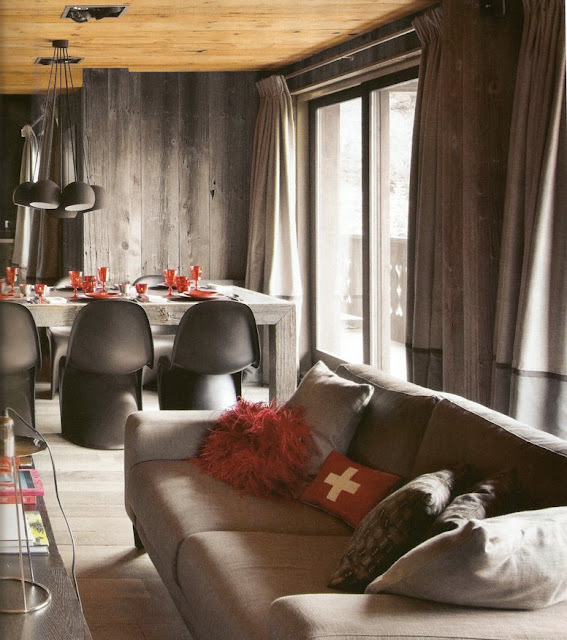 This ski chalet in Meribel, France, uses rough-hewn, naturally aged wood in its interiors for a surprising and modern look. 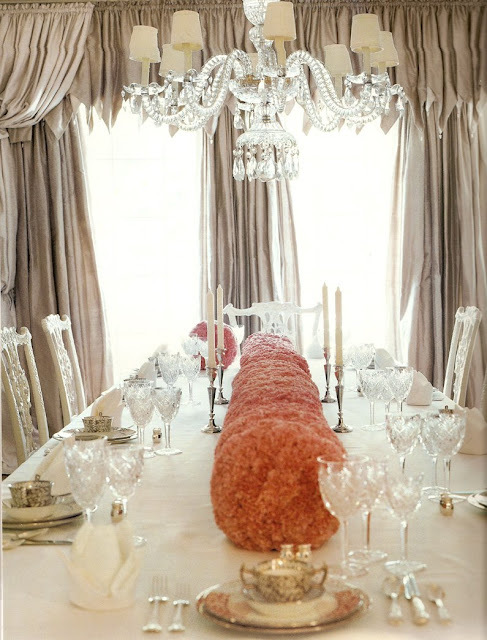 Red glassware set on the dining room table is exhaulted in an otherwise desaturated space. To keep gray from slipping into the impersonal, cold territory occupied by office cubicles and prison blocks, texture and pattern must play key roles in the scheme. In the bedroom above, the heavily textured wood pairs with multiple patterns (on the chaise, window blind and bedspread) to achieve a warm space. 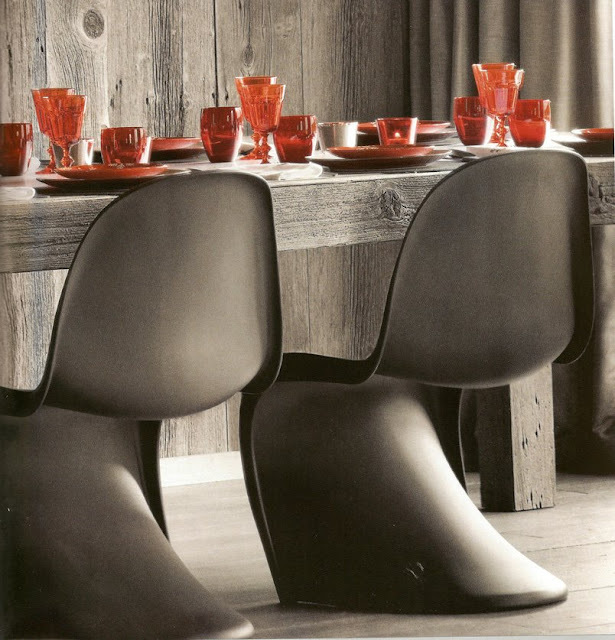 Warm tones, like the red cushion, are also used as punchy accents. There is nothing modern about this vignette, with its pair of Ephraim Stahl chairs (1773) reupholstered in gray suede, the Jan Ake gray-marble-top console and the French Empire clock. 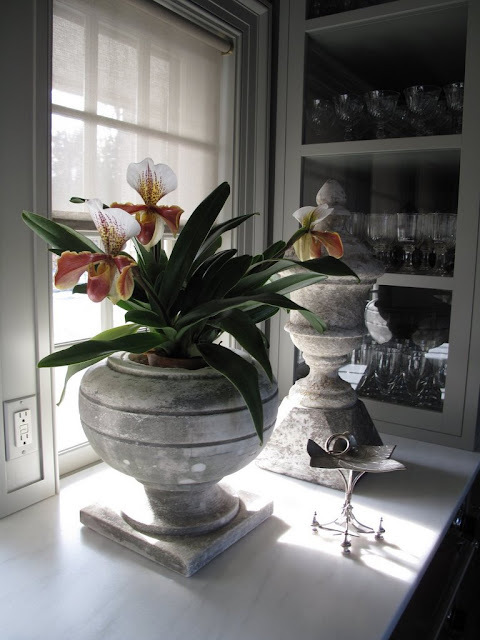 There is something timeless about gray, which can be used in both modern and traditional spaces. 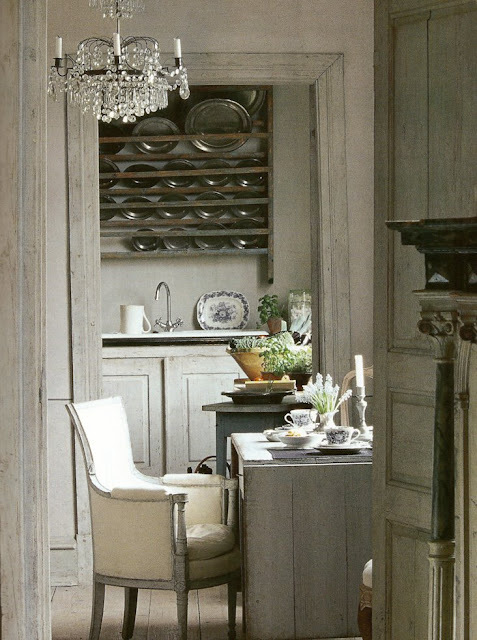 The kitchen of a rustic French country house is imbued with the calming atmosphere of a bluish gray tint. 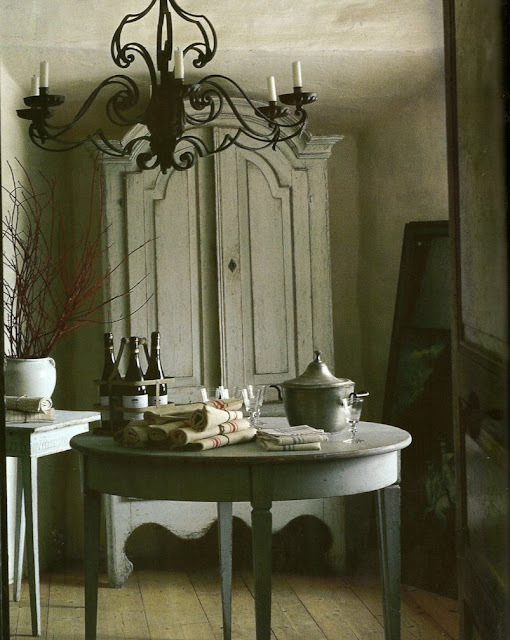 A French provincial armoire in gray is the centerpiece of this small country dining room, with its putty walls and clay-toned furniture. An Italian apartment is given lustre, clarity and softness with its polished palette of subtle grays and light sheers. Martha Stewart Living's executive vice president and creative director, Eric Pike, chose gray for his gorgeous Manhattan apartment. The kitchen, above, is a small space but is given the sophistication and utility of a smart suit with its restricted gray palette. 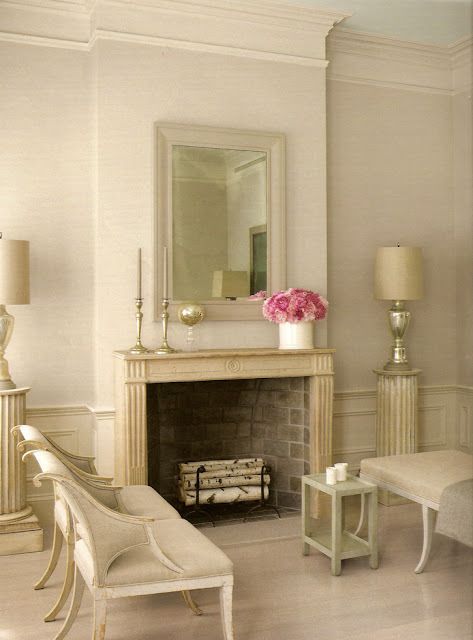 Eric Pike's living room is uncluttered and serene, with a nineteenth-century French limestone fireplace mantel as its centerpiece - a gift from Martha. "I spend my days refining stories with different colour palettes and stylistic sensibilities," he says. "[Gray] helps me unwind." Gray silk curtains in a Georgian dining room add to the lustrous, polished look. The carnation centerpieces are given total freedom to shine in such a subdued palette. Martha grew these lady-slipper orchids from tissue samples she brought back from India more than ten years ago. They are given their ideal setting today in her servery at Bedford, which is entirely gray. 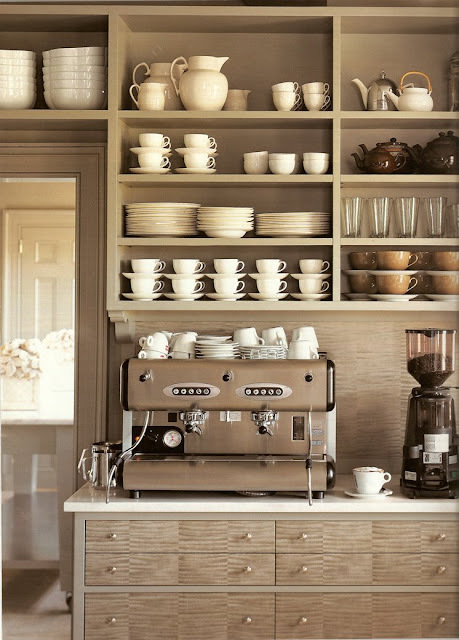 Martha's Bedford kitchen is always a hub of activity, so organization and utility were key to the design. 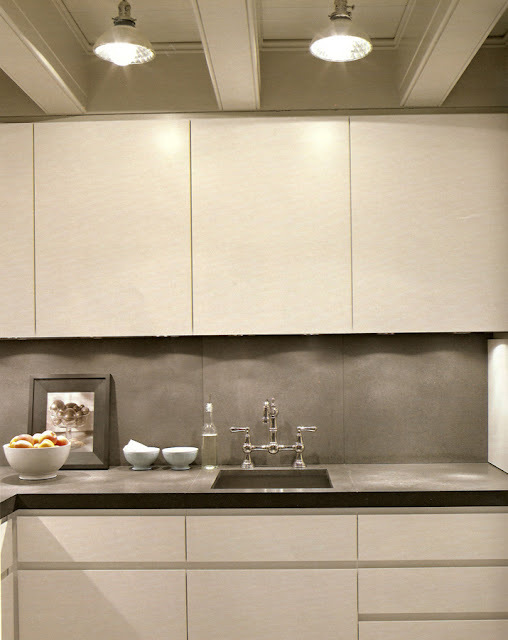 Gray sycamore veneer cabinetry mixes with high-grade, professional appliances for a utilitarian but warm look. Andrew, oh my gosh....posts like this one are exactly why i read you first every day. I'm in the process of redecorating my condo and you've given me food for thought. I'm movng to a minimalist (with lots and lots of storage) viewpoint and posts like this help clarify what i'm looking for. Glad to hear it, Vicki! I have a new section on the blog called interiors, which I hope to add to over the coming months with stories like these. Gray is a wonderful choice for a modern condo. I hope the little tips and insights into gray will be useful to you! Yeah! I agree with you, This is "Amazing Grays" I don't always use gray color, but now I can see the beauty of gray. I think I can use it usually. Thanks for sharing.